The fifth annual round of festivities for EXPO CHICAGO, The International Exposition of Contemporary and Modern Art, drew to a close on September 25. This year, the art festival hosted work from 145 galleries from around the world, with participants from twenty-two countries and fifty-five cities, and presented the creations of more than 3000 artists. According to the organizers, approximately 38,000 visitors came to Navy Pier to celebrate this yearly art week. For EXPO, this year’s festival represents the further success of its efforts to build up Chicago as a destination for the international art community. The fair attracted 3,000 more visitors than last year and increased the number of countries represented from sixteen to twenty-two. Yet even as the program grows in international renown, the number of Chicago-based galleries—and especially South Side ones—remains small. Of the 145 galleries presented in EXPO this year, sixteen are Chicago-based. Though this number is drastically dwarfed by New York’s fifty-four, EXPO’s president Tony Karman thinks that considering the variety of participants in the exhibition, Chicago is taking up its fair share. The energy and ambition behind this grand event comes from Karman, who witnessed the downfall of Art Chicago, a previous international fair for contemporary art, and became determined to return Chicago to the map. “It’s a great tradition of having an international art fair in Chicago for many, many years, and there’s no question that we can both sustain and invite the world every year and be relevant to international art world,” Karman said. The threshold for making it onto EXPO CHICAGO’s roster is fairly high. Most galleries pay steep costs to rent booths at EXPO; a small booth, 400 square feet, costs $23,000, while an extra large booth costs up to $50,000 for its 1,000-square-foot space. One major way small or cash-strapped galleries can avoid the high rental price is to apply for EXPOSURE, a program run by EXPO CHICAGO that is intended to encourage young galleries (those less than eight years old) to apply for entry to the expo. “[EXPOSURE] provides emerging galleries with lower prices to participate in the art fair and also creates opportunities for them to showcase one or two artists in their programs,” explained Karman. This year there was only one gallery in Chicago favored with this opportunity: Efrain Lopez Gallery, located on Damen Avenue in Wicker Park on the North Side. As part of EXPOSURE, the gallery was able to rent a booth with two hundred square feet for $8,000. The gallery’s owner, Efrain Lopez, initially told the Weekly that he would love to discuss his experience but did not reply to further questions. According to Karman, the EXPOSURE Selection Committee has no quota for the number of galleries from each city that may be selected to participate in the EXPOSURE program, but he said the program has never been offered to more than twenty-four galleries. He did not reveal the number of total applications. This year’s Selection Committee for the EXPOSURE program consisted of two art dealers, both New Yorkers. The Selection Committee for the main program, which is the final authority on the list of galleries that participate in EXPO Chicago, includes a wider group; this year it consisted of eight senior art dealers: three from New York, two from Chicago, two from San Francisco, and one from Los Angeles. The Weekly sent inquiries to the National Museum of Mexican Art regarding the relationship between the museum and EXPO CHICAGO but did not receive a confirmation or denial by press time. However, the Renaissance Society, the UofC’s contemporary art gallery, confirmed its participation in EXPO for the past three years. As part of EXPO’s Special Exhibitions program, designed to highlight contemporary and modern art nonprofits, it was able to secure a booth on the grand first floor of EXPO to showcase its recent exhibitions. Similarly, the UofC itself had a booth showcasing the work of recent graduates from its Department of Visual Arts MFA program. But nearly all the Chicago galleries that presented at EXPO CHICAGO this year are located on the North Side of Chicago—specifically the neighborhoods of Wicker Park, River North, West Loop, and the Loop. 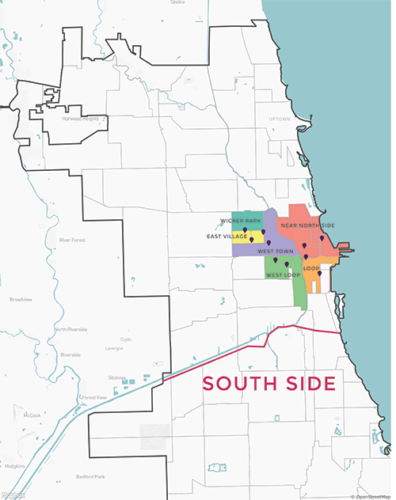 In the Weekly’s inquiry into South Side gallery involvement with EXPO CHICAGO, only one institution replied aside from the UofC’s Renaissance Society—Gallery Guichard on 47th Street and Vincennes Avenue. “No, unfortunately we have not interacted with the EXPO CHICAGO fair and do not know of any other galleries or artists that do,” said Frances Guichard, the owner of the gallery. For Karman, EXPO CHICAGO is an occasion that brings together all kinds of people who enjoy modern art. “It’s meant for both seasoned professionals as well as individuals who are just lovers of art,” he said. However, at least thus far, the expo seems to be not so much concerned with being a product of its city—south, north and west—as it is with producing an image of Chicago for the world.